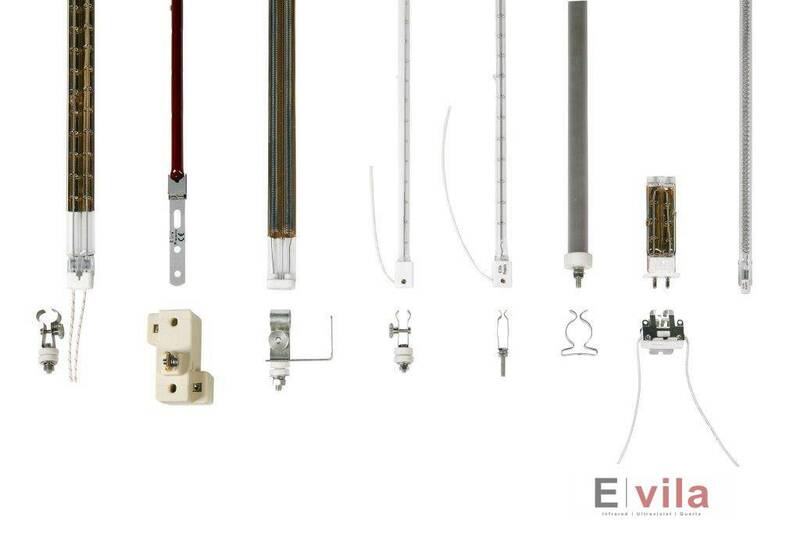 E.VILA Projects & Supplies SL has the widest range of short, medium and long wave infrared emitters. Translucent and transparent quartz, incorporating all types of reflector (gold, ruby ​​or alumina). We supply twin or monotube tubes in different constructions according to the needs of the client. HOW DO OUR INFRARED LAMPS ACT? How do our lamps act? Its construction allows us to concentrate the wavelength of the spectrum used in industrial heat, from 1 to 4 microns. All depending on the material to be heated. 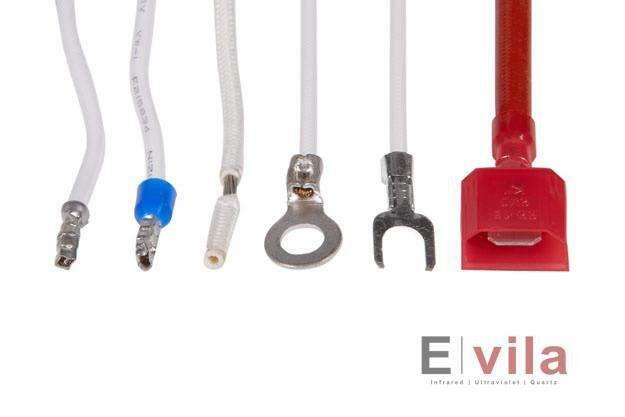 Our technicians will advise you on the product that best suits your needs. 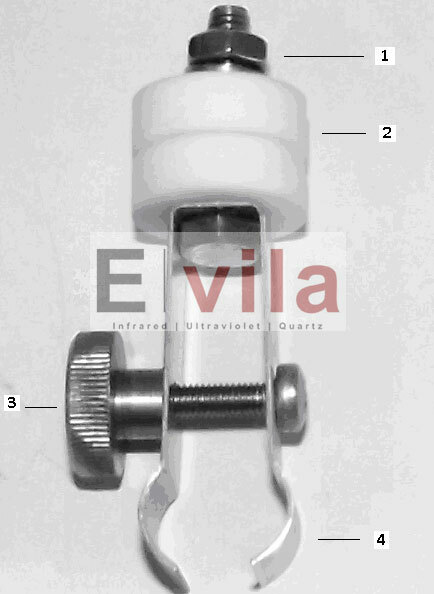 We design all kinds of infrared lamps for laminated glass cutting table. We design your special lamps in monotube and bi-tube in 3D mode that allows you to follow the shapes of the pieces to be treated. A reflective coating is applied to the surface of the lamp, usually covering 180 ° of the quartz tube. The infrared heat is emitted forward through the quartz tube, and is reflected in the back to be redirected. Infrared lamps compatible with all manufacturers on the market such as: Side, Sidel, Krones, Nissei, Sipa etc. 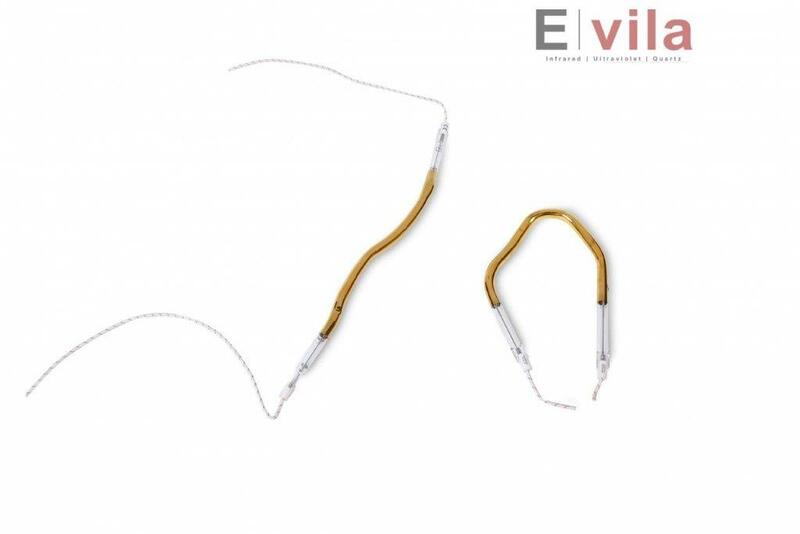 E.Vila Projects develops all kinds of curved lamps adapted to the needs of the client. Within the group of special lamps, it is worth mentioning the lamps in the shape of a circle or ring, where the reflector can be positioned in the most suitable position to direct the infrared radiation to the desired place in a direct way. The quartz used for this application is a material that can be bent, deformed or follow a three-dimensional contour to be adapted perfectly to the design of the piece or application needed. We design all types of lamps with carbon technology in both monotube and twin tube. The infrared lamps with carbon technology allow a high efficiency in drying paints with low incidence on paper. E.Vila Projects can provide all Standard and customized models on a plan adapted to the needs of the client’s application. We design ruby ​​lamps that significantly reduce glare. 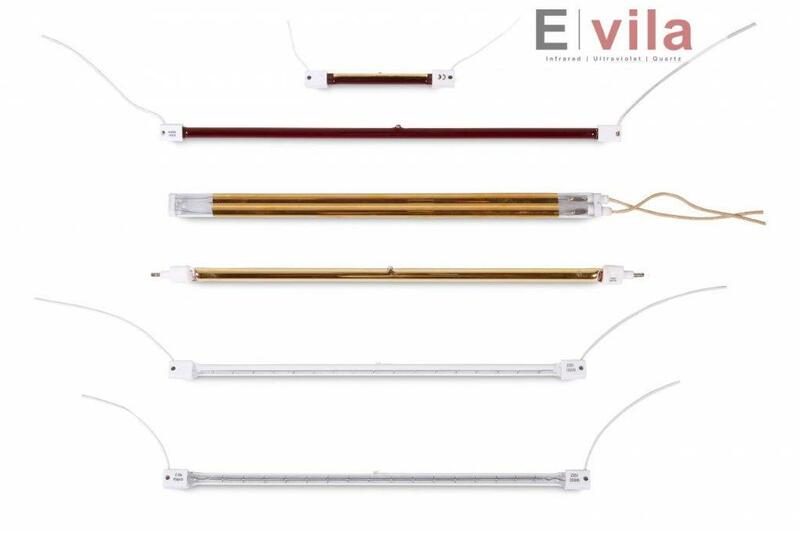 Another model developed is the ruby ​​lamp with a gold coating on the tube that reduces glare to a minimum and is an ideal lamp to be installed in visible work areas. 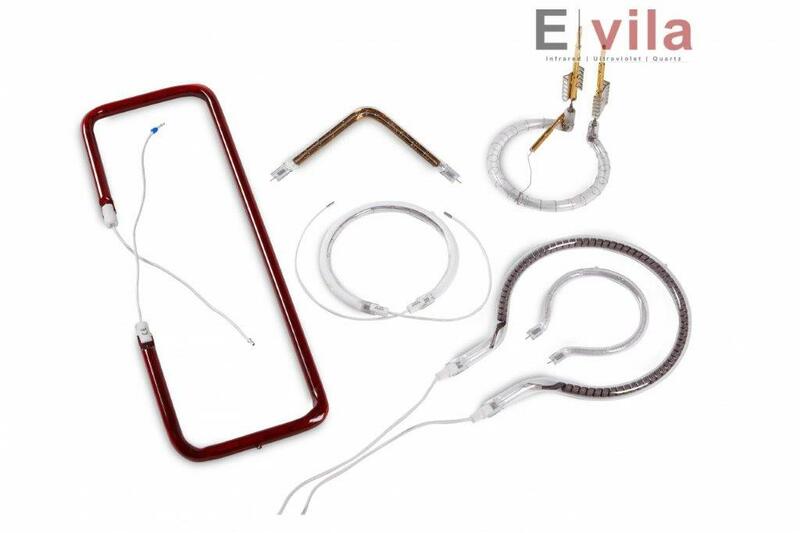 E.Vila projects can design all types of supports for the fixation of IR lamps, both monotube and twin tube and for all connections. Given the characteristics that these supports require, their design is essential for the maintenance of the lamps and must be manufactured by specialized companies. ELECTRICAL CONNECTION: The electrical connection must be carried out by qualified personnel, complying with the safety regulations. If possible, an independent wiring installation for the I.R. in a junction box without grouping, twisting or bending with sharp angles. The maximum nominal voltage for which the elements have been individually designed must always be respected. Take special care with three-phase connections. 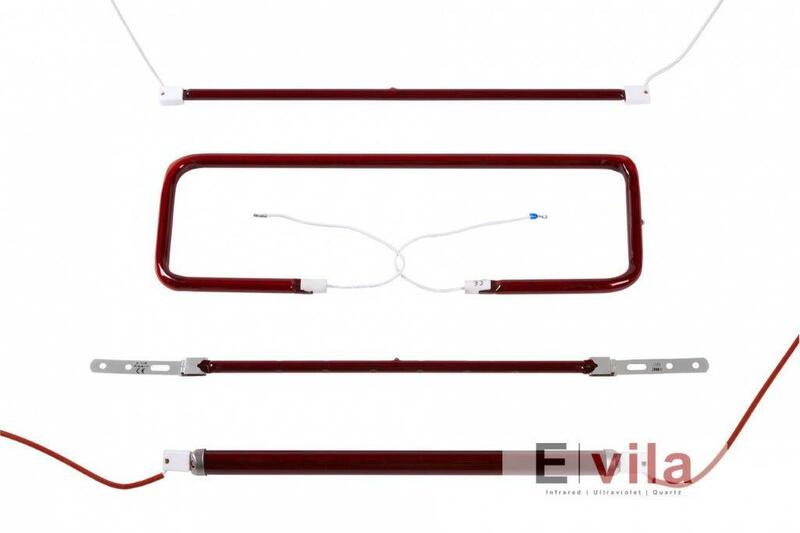 SCREENS AND SUPPORT: The design and assembly of these elements must take into account the UNE-EN 60.335-1 standard, regarding protection against electrical contacts, insulation, leakage currents and ground connections. HIGH TEMPERATURES: the emitters I.R. They generate a large amount of heat, so it is essential that the personnel handling irradiated objects or lamps be adequately protected and indicate the surrounding and irradiated surfaces to avoid direct accidental contacts that could cause burns. In potentially explosive atmospheres, there could be a risk of ignition, to avoid this, the necessary measures have to be taken as insulation from the heat source, in this case the I.R. emitters. RADIATION: the I.R. It is a non-ionizing radiation, potentially not very harmful. However, the direct vision of the emitters and prolonged exposures on skin must be avoided, due to possible burns. These indications must be taken into account when designing and assembling. Medical studies suggest that the use of I.R. radiation, particularly in its prolonged use for years or decades, can cause damage to the cornea, causing cataracts by irradiation. For the protection of the users we put at your disposal glasses of protection for the radiation I.R. 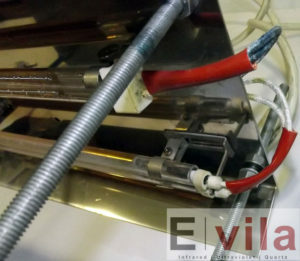 MAINTENANCE INTERVENTIONS: Ensure the disconnection of the voltage before any intervention, let the emitters cool down and use E.P.I. (individual protection equipment) as for the handling of glass. WASTE MANAGEMENT: Exhausted or damaged emitters must be managed as a special waste, through an authorized waste manager or the nearest selective collection point. 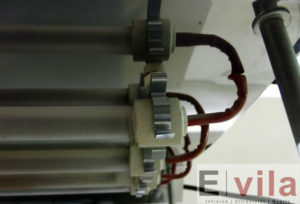 Although the emitters do not need maintenance, both the monotube and the twin tubes, it is recommended to clean them regularly, both at their installation and in their normal use, especially the quartz crystal. Once the transmitter is defective, it must be changed. To assemble the lamps, they must be cleaned before installation. When transporting them it is important that they are in their original packaging. The medium wave single emitters are fixed to the reflecting screen with the following supports. Two holes of 9.2 mm in diameter should be opened at each end of the reflecting screen, taking into account the length of the tube, where the supports will be placed. Once the supports are anchored, with the reflecting screen in the middle of the two ceramic pieces; you can proceed to locate the infrared. Before mounting, the emitters must be cleaned. When transporting them it is important that they are in their original packaging. 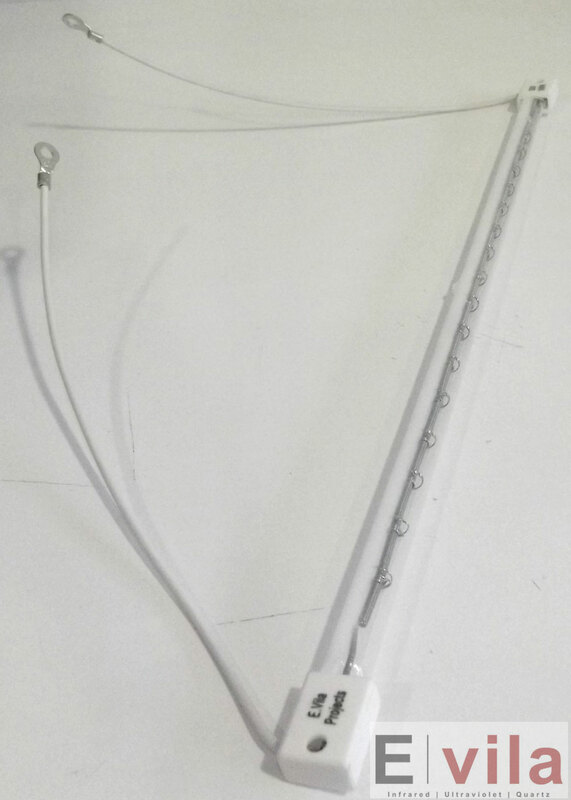 The emitters are designed for horizontal use, there are other types of lamps for vertical use. It is very important to maintain a fixed angle, between the surface to which the anchor of the emitter is made and the tube itself, this is because the medium wave emitters are not vacuum sealed, this angle is fixed by special supports for secure this condition. 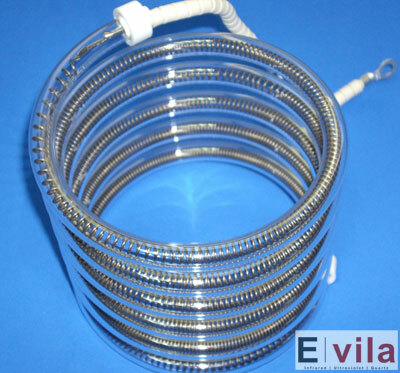 In the images there is a medium wave bi-tube, in which it is observed that it is not vacuum sealed; the special supports for half-wave twin-tube assemblies and one already-mounted twin tube. Two holes of 9.2 mm in diameter should be opened at each end of the screen, taking into account the length of the tube, where the supports will be placed. Once the supports are anchored, with the reflecting screen in the middle of the two ceramic pieces; you can proceed to place the emitter. The emitters must be cleaned before mounting. When transporting them it is important that they are in their original packaging. The lamps have been designed for horizontal use, there are other types of lamps for vertical use. The shortwave emitters are closed to the vacuum, for this reason it is not critical to maintain a fixed angle, as in the medium wave bi-tube. 1. Washer for fixing to the reflecting screen. 2. Ceramic pieces for thermal insulation. The reflecting screen is located between these two pieces. 3. 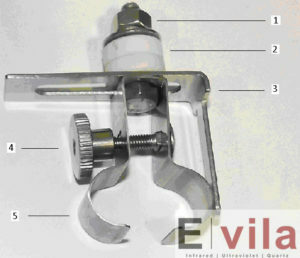 Nut to adjust the clamps. 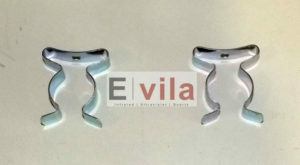 The short wave supports are made in the following measurements: 23 × 11 mm and 34 × 14 mm. 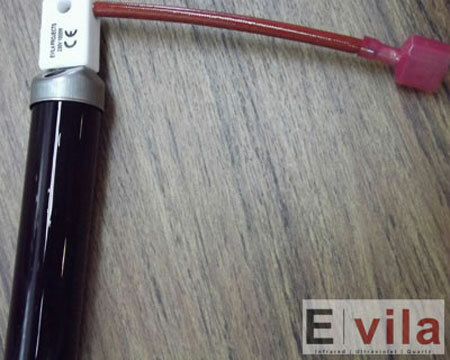 The image shows a short wave single tube. Before cleaning the lamps have to be cleaned. When transporting them it is important that they are in their original packaging. The short-wave infrared is closed to the vacuum, for this reason it is not critical to maintain a fixed angle, as in the medium wave bi-tube. 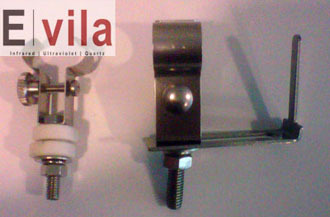 The short wave lamps are fixed to the screen by supports for short wave bi-tube. Said supports will be attached to the emitter at the ends, where there is a lower temperature. The structure of the two-tube supports is the same as those of the single tube. Two holes of 9.2 mm in diameter should be opened at each end of the screen, taking into account the length of the tube, where the supports will be placed. Once the supports are anchored, with the reflecting screen in the middle of the two ceramic pieces; you can proceed to place the lamp. In the images you can see a twin tube and a tube with supports. Having the screen on which you want to make the assembly, drill at the distance where the supports will be fixed, taking into account the length of the tube. We proceed to the placement of the supports. Once the supports are fixed, the emitter is placed. The reflector of the lamp, if it has it, in the case of the example is of gold; it must be against the face that points to the stainless steel structure, to the side oriented to the object to be heated.